The Pauli Murray House restored to its 1910 appearance. It is in this spirit of embracing the full spectrum of our history that the National Trust has joined an effort to create the Pauli Murray Center for History and Social Justice in her childhood home in Durham, North Carolina. Built in 1898 by Murray’s maternal grandfather, the humble home she shared with her grandparents and aunts shaped her lifelong commitment to democracy, civil rights, and gender equality. Rehabilitating and converting the house into the Pauli Murray Center will advance her vision for justice and reconciliation through sharing her life story, examining her legacy, and providing a place for today’s scholars, poets, lawyers and activists to engage in social justice work. The summer of 2016 brought major rehabilitation work to the badly dilapidated home. With support from major donors, Iron Mountain and the Marion Stedman Covington Foundation and an outpouring of support from individual supporters, funds were used to construct a new roof, rebuild the porch and install appropriate windows. Interior work also involved jacking the home up six inches in the center, replacing the foundation and laying new piers to compensate for damage caused by water runoff from the public cemetery adjacent to the home. 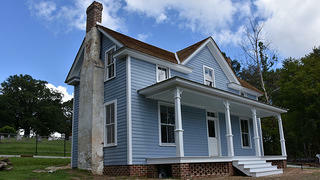 The exterior was also changed from white to blue/gray, in keeping with the home’s look in 1910. While there is still restoration to be done, the Pauli Murray Center is beginning to develop interpretation strategies for the entire site. The house is quite small and the only artifact the Center owns of Pauli Murray’s is her address book, so the house will not operate as a traditional house museum. Instead, it will tell Pauli Murray’s story through text panels, interactive exhibitions and community-based programming. To assist in this visioning, the team will be travelling to historic sites with cutting-edge interpretation, such as the President Lincoln’s Cottage in Washington, D.C. and the Lower East Side Tenement Museum in New York, among others.